The 2014 APEC Summit is held annually in Beijing from November 5 to November 11. It is the first reunion in China after the successful Shanghai APEC Summit thirteen years ago in 2001. With the theme of "Co-Constructing the Future-Oriented Asia-Pacific Partnership," the 2014 APEC covers three important topics: advancing regional economic integration; promoting innovative economic development, reform, and growth; and strengthening comprehensive interconnection & interworking and infrastructure construction. The summit consists of several meetings, including the Informal Leadership Meeting, the APEC Ministerial Meeting (AMM), and the Concluding Senior Officials' Meeting (CSOM). 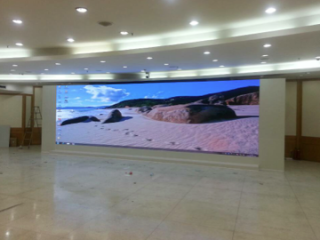 Leyard’s TV1.6 Small Pixel Pitch LED Products in the APEC Chief Command Room. The major conferences at the 2014 APEC Leadership Meeting are held in the China National Convention Center in Beijing Olympic Park, adjacent to the symbolic Olympic building—the Bird’s Nest. During the opening ceremony of the 2008 Olympic Games, a huge Olympic Scroll was unfolded on the floor and the Olympic Five Rings were lifted up in the air of the Bird’s Nest. As the creator of those two projects, Leyard again assisted an important international events - the APEC Summit, by creating the beautiful scene of lights and shadows in the Bird’s Nest and creating a visual feast of LED technology. To celebrate the commencement of the APEC meetings, the brand new LED grille screen has been installed on the surface of the Bird’s Nest and will be lit for APEC. In addition to the creative illumination project of the Bird’s Nest, which creates a most splendid and brilliant visual feast at APEC, Leyard is also in charge of the construction of the large display screens in the APEC Chief Command Room and the Comprehensive Security Hall of the Beijing Municipal Public Security Bureau in the China National Convention Center. The two projects have adopted TV1S6 and TV1S9 small pixel pitch LED display screens as the precise and HD information display platforms, which will ensure a smooth execution of the APEC Summit. In addition, as an outstanding enterprise leading the development of the “high-grade, precision and advanced” scientific research, Leyard has been selected to attend the Exhibition of the APEC Leaders Summit. On that occasion, Leyard will demonstrate its 110 inch large-size self-luminous TV to all participating leaders from all countries over the world, to demonstrate the advanced technology of Leyard’s small pixel pitch TV.